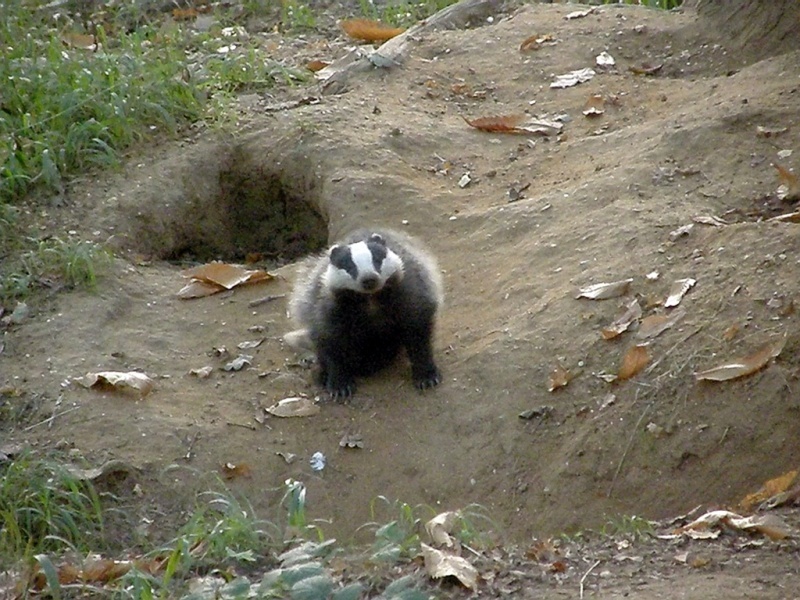 Fieldnotes: 1st October 2011 – A fine summer evening of badger watching – in October! It’s been a confusing day. It’s October, but it’s felt like July. The hottest day in October ever, apparently. Mrs BWM and Scarlett are away, so I’ve been doing what any man would do – cutting the grass, tidying the vegetable beds and visiting plumbing shops. And, what with it being such a nice day, watching badgers. This is late in the season for me to be badger watching, but I haven’t been out much lately so I took the opportunity. Partly to see how the badgers are doing, partly just because it’s nice to be out in the woods. It may have felt like a summer’s day, with the warmth and the smell of fresh-cut grass, but it is definitely autumn. The wheat field on the way to the wood has been sown with winter wheat, and it is already a couple of inches tall. In the wood itself the trees were alive with the scurrying of squirrels, busily gathering food for the winter. Having now seen red squirrels I can allow myself to feel a little blase about ordinary grey ones. The badger sett is surrounded by chestnut trees and the squirrels were working them hard. The still evening was punctuated by a steady rain of chestnuts dropped from the treetops above. I was interested to see that the western end of the sett is in active use again, as so far this year the badgers have confined themselves to the east end only. 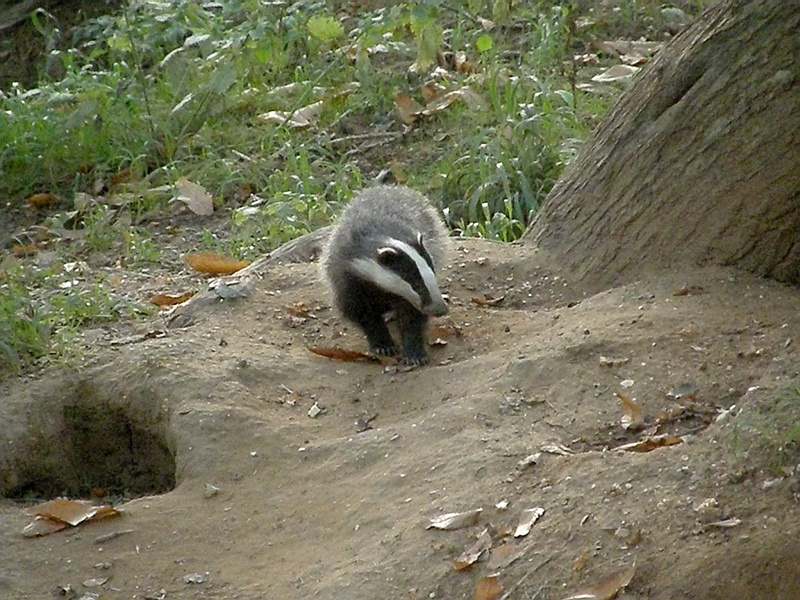 At 6.10pm the young badger emerged from the west end, had a good scratch and a snuffle about, and went back in. It looks very much like the cub has moved out of the parental home and set up on his or her own. The movement of badgers within the sett continues to fascinate (and puzzle) me. This is as clear an example as I’ve seen of this movement, made more visible by the low number of badgers this year, but I still don’t know what drives a badger to change from one hole to another. At 6.16 a badger emerged from the east end of the sett, followed a minute or so later by another. My best estimate is that there are only three badgers in residence this year, so here they all were – daddy badger, mummy badger and baby badger – a proper family unit. Here’s hoping that the numbers continue to build up next year. I sat for a while against a tree and watched the badgers foraging as the light faded, getting bitten by late mosquitoes and half-expecting to be hit by a chestnut dropped by one of the squirrels. Despite having watched badgers for some years now, I never get tired of sitting in a wood at dusk, sharing the evening with badgers as they go about their business. I sat and watched as one of the adults slowly snuffled closer and closer. 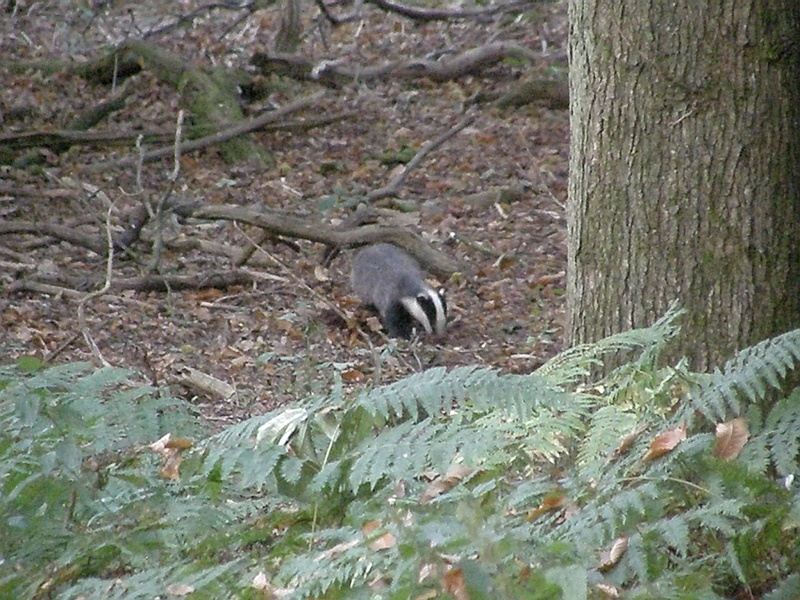 When it reached about 20 feet from me it stopped and sniffed the air before trotting back to the sett. There was no wind, but it had obviously got my scent. I took this to be my cue to leave. So ended a pleasant evening – sitting out in just my shirt, watching badgers in October. It is very strange to be so warm in October. I too have been badger watching this evening; I have just returned home at 9am. It is so unbelievably warm this evening. Yes, it was a strange evening. When the badgers came out soon after 6pm I thought “why are they early – they don’t normally come out until 8pm?” And then I remembered it was October and it would be dark by 7.30. It felt just like an evening in July. Hi Ruth – yes, it was a good evening all round. I hope the mild weather continues until next week.